IceMelz eco is a leading company in the field of sustainable de-icers that contribute to a better working and living environment. 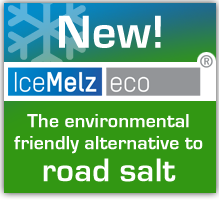 IceMelz eco offers a wide range of products and focusses its scientific capabilities to meet customers demands for ecologic de-icers. Contribute to a world with only ecological sustainable products. support product offering with technical training and product expertise combined with sales and supply chain support from a global leading distributor.